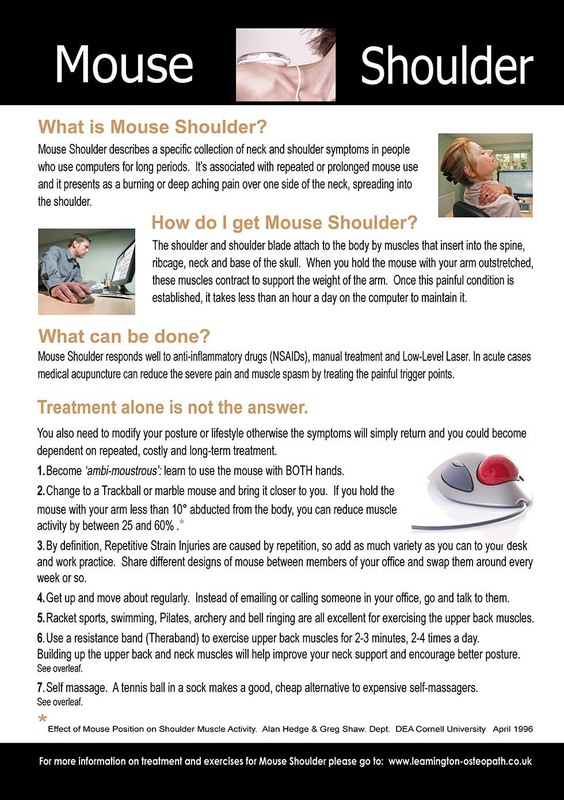 Mouse Shoulder is a term that has been used to describe a specific collection of neck and shoulder symptoms noticed in people who use computers for long periods. Mouse Shoulder can present as a pain over one side of the neck, spreading into the shoulder. The pain is often described as “burning” or deep aching, and is associated with repeated or prolonged mouse use. 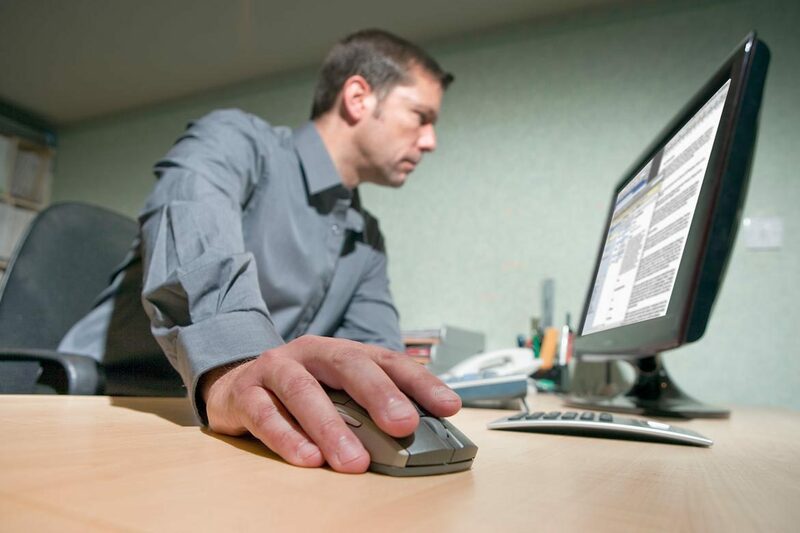 It may take several weeks or months to develop, but once established Mouse Shoulder can take less than one hour of mouse use a day to maintain this repetitive strain state. How do l get Mouse Shoulder? The shoulder and shoulder blade attach to the body by various muscles that insert into the spine, ribcage, neck and base of the skull. Holding a mouse with the arm held away from the body causes these muscles to contract, as they support the weight of the outstretched arm*. Sitting like this for several hours with little variation or relaxation can, in time, lead to pain and weakness. Mouse Shoulder responds well to a combination of anti-inflammatory drugs (NSAIDs), manual treatment and low-level laser. In acute cases medical acupuncture can reduce the severe pain and muscle spasm by treating the painful trigger points. However, treatment alone is not the answer. Without any modification to work posture or lifestyle these symptoms will return within days or weeks. You are then at risk of becoming dependent on repeated, costly and long-term treatment. How can l help myself? 1. Become ‘ambi-moustrous’: learn to use the mouse with BOTH hands. It may be hard at first but, if you persevere, within a couple of weeks you will be surprised at how easy it will become to use your mouse with either hand. 2. Change your mouse to a Trackball or marble mouse and bring it closer to you. Research has shown that holding the mouse with the arm less than 10° abducted from the body can reduces the muscle activity by a factor of 25-60% *. 3. One of the most important things to remember about Repetitive Strain Injuries is the word REPETITIVE. Add as much variety as you can to your desk and work practice. Share different designs of mouse between members of your office; swap them around every week or so, to add to the variety. 4. Get up and move about regularly. If possible, rather than emailing or telephoning someone else in your office – go and talk to them in person. 5. Activities such as racket sports, swimming, Pilates, archery or bell ringing, will exercise the upper back muscles. 6. 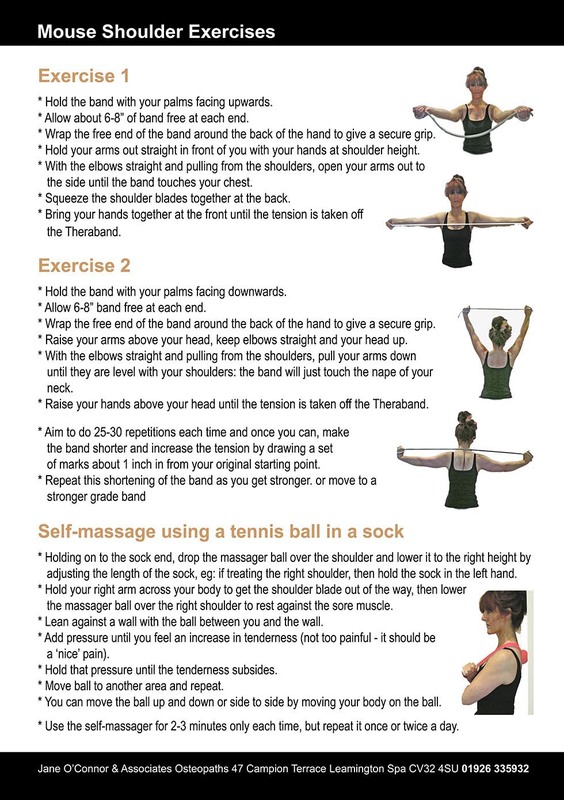 Use a resistance band (Theraband) to exercise upper back muscles for 2-3 minutes, 2-4 times a day. Building up the upper back and neck muscles will help improve your neck support and encourage a better posture. We will be pleased to show you the best exercises to help rehabilitate weak postural muscles. 7. Self massage. A tennis ball in a sock makes a good, cheap alternative to expensive self-massagers. We can show you simple techniques to massage your own shoulder muscles. Please telephone the practice reception 01926 335932 to request copies.